It's been a long time now since floppy discs and their drives were significant to file storage--not that you could store much on them anyway. They were also pretty loud to boot up in comparison to CDs and USB sticks. That said, we all still have a few floppies lying about gathering dust. If you do and want to put them to good use, try making sweet music with them instead. Wait, what? 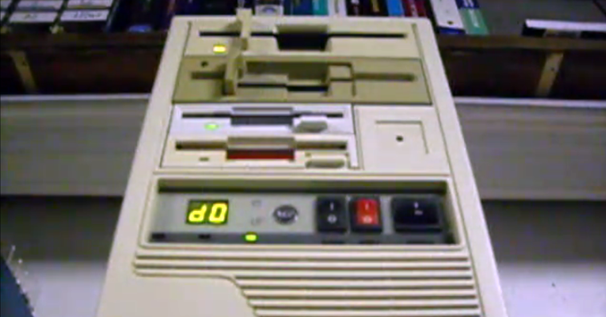 YouTube user George Whiteside created the Phantom of the Floppera out of two 3.5-inch drives and two 5.25-inch drives connected to a PIC18f14k50 microcontroller. Over USB, it can then connect with any MIDI source. The MIDI in his version responds to 128 MIDI notes. The four drives use different tones and ranges, and are generally arranged painstakingly by hand. As George explains: "It features two modes of operation. In one mode, MIDI channels one through four are played directly on floppy drives one through four. In the other mode, all 16 MIDI channels are read and notes are "intelligently" divvied out on a first-come, first-serve basis. "'Note stealing' ensures that melody lines sound, but chords are often cut short. One or the other produces acceptable results for many unmodified MIDI files straight out of your favorite media player." Check out the video below of his floppy disk setup doing its thing. As you can see, it's far from a flop (sorry, lame joke). Of course, George is not the first person to put floppy drives to musical use. Check out this amazing Star Wars one, or this floppy remix of Happy birthday (turn your volume down for this one!). Not forgetting other objects that are capable of performing, like a scanner doing the Vivaldi Spring piece as it scans. Although, the most ultimate in making PCs musical has to be this retro computer orchestra doing Queen's Bohemian Rhapsody. So, if you have a lot of old PC drives and accessories lying around, why not recycle and give it a go. Don't forget to tell us if you do!